When you dial 999 and you can't speak press 55 on your dial pad to go straight through to the police. When you dial 999 and you can't speak, simply press '55' on your dial pad to go straight through to the police. The Independent Officer of Police Conduct (IOPC) have implemented a Silent System as around 50 silent calls were being made a Day. When someone called Ms Power made a Silent 999 call in the early hours of December 14, 2013, the system wasn't activated in her town (Devon), so when her ex-partner broke into her home the police didn't know about the call that came through so didn't send units to her house. Her Ex-Partner then called the police later that morning to say he had strangled her. IOPC made a statement saying "It is always best to actually speak to a police call handler if you can, even if by whispering, but if you are putting yourself or someone else in danger by making a sound, there is something you can do, Make yourself heard by coughing, tapping the handset or once prompted by the automated system, by pressing 55." The call handler will stay on the line and listen to the conversation with the police IOPC explained in a later announcement, the police call handler will try to get you to answer 'yes' or 'no' questions by either taping the handset or coughing or maybe even whispering if possible. The police service receive 12 million calls a year and only some of them know how to use the silent call system. It helps survivors of domestic abuse because they usually are threatened to be killed if they phone the police or if their house is being robbed they can use the silent system and units will be sent in minutes. 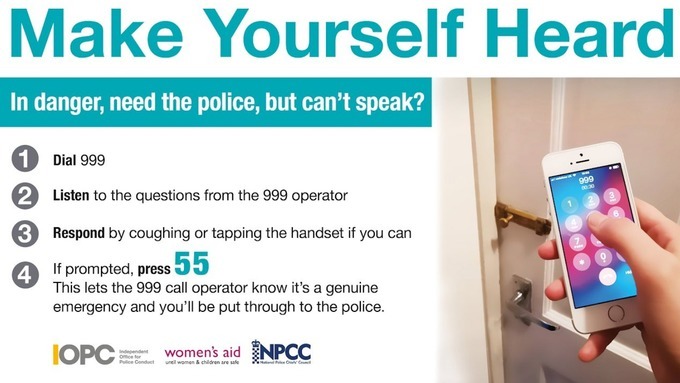 If you do not alert the handler in any way or press 55 in 45 seconds your call will be terminated and you will not receive any help, the police told unknown sources "Don't just think if you dial 999 then press 55 that the police will attend." Do you think this system is helpful? tell us in the comments below! Will, it was already in place just that people didn't know about it. Yep, this will definitely help to save more lives, i think it is something we've needed in a while.